Global CO2 production went from 22.5 gt to 35.7 gt. A 12.2 gt increase. Maybe sending all those jobs to China was not a good thing. I came across a new paper trying to claim that increased temperatures caused by global warming will kill more “old people” in Beijing. In the supplementary data they posted the graph of daily mortality. First thing I noticed is that deaths peak in January and bottom out in the summer. Yes there are some summertime spikes. But it appears that something like 60 more people die per day die in January than in July. It seems to me that if winters are warmer, lives will be saved. China is building a network of Ultra High Voltage power lines to move electricity long distances. They even have plans to build UHV lines to Germany so they can sell the Germans cheap electricity generated by coal. While UHV has been used in Russia and other counties in the past, China is perfecting it. The US grid, for example, operates at 500kv or lower. UHV allows the transmission of very large amounts of electricity with more efficiency. What are the advantages of UHV? Increased Transmission Capacity: A single 1000 kV UHV-AC circuit can transmit +/-5 GW, approximately 5 times the maximum transmission capacity of a 500 kV AC line. An 800 kV UHV-DC transmission line is even more efficient, with a capacity to transmit 6.4 GW. Extended Transmission Distance: A 1000 kV UHV-AC line will economically transmit power distances of up to 2,000 km (1240 miles), more than twice as far as a typical 500 kV AC line . An 800 kV UHV-DC power line can economically transmit power over distances of up to 3,000 km (1,860 miles). Reduced Transmission Losses: If the conductor cross-sectional area and transmission power are held constant, the resistance losses of a 1000 kV UHV-AC line is 25% that of the 500-kV AC power line. The resistance loss of an 800 kV UHV-DC transmission line is an even more remarkable 39% of typical line power erosion. Reduced Costs: The cost per unit of transmission capacity of 1000 kV UHV-AC and 800 kV UHV-DC transmission is about 75% of 500 kV AC costs. Reduced Land Requirements: A 1000 kV UHV-AC line power line saves 50% to 66% of the corridor area that a 500 kV AC line would require. An 800 kV UHV-DC line would save 23% of the corridor area required by a 500 kV DC line. 1,000 more coal power plants for China. And then power exports all the way to Germany. Ban the importation of all goods and services from China. Cement productions is supposed to be a serious component of “global warming”. 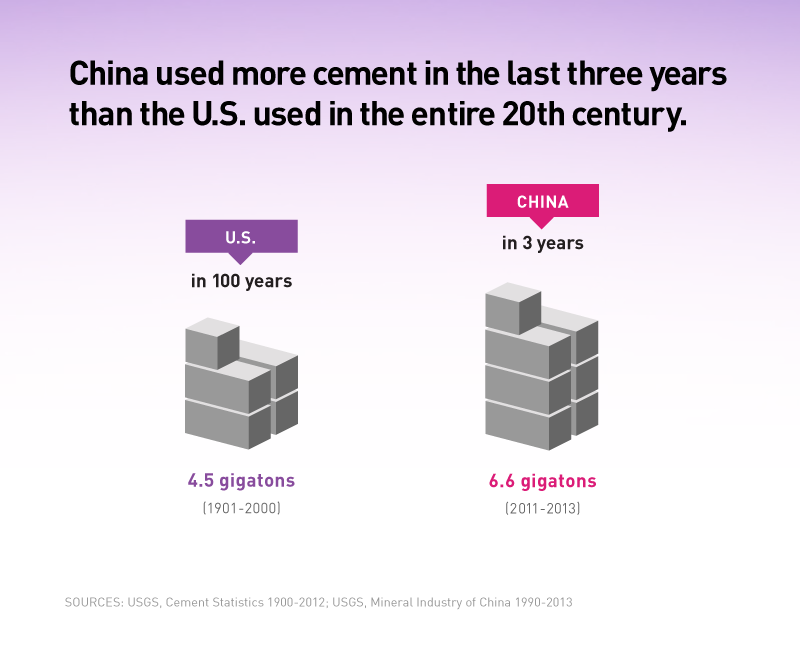 Yet China has produced more cement from 2011-2013 than the USA did from 1901 to 2000. And warming STILL hasn’t occurred.